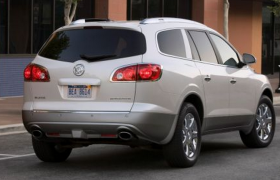 The recall includes 2008-12 Buick Enclaves. General Motors is recalling 779,023 SUVs globally, including 686,287 in North America, for gas struts on power lift gates that can prematurely wear, causing the gate to fall on people. There have been 56 reported injuries linked to the defect. A GM spokesman declined to comment on the nature of the injuries. So far, no crashes or deaths have been connected to the defect. This is GM’s largest recall so far this year. In 2014, GM recalled nearly 27 million vehicles in the U.S., including more than 2.6 million vehicles that were recalled for faulty ignition switches now linked to 121 fatalities. GM first began investigating the lift gate problem in September 2010, but closed the investigation less than a month later due to a low rate of incident reports. The automaker reopened the investigation in March after reports re-emerged in late 2014. The recall affects 2008-12 Buick Enclaves, 2009-2012 Chevrolet Traverses, 2007-12 GMC Acadias and 2007-10 Saturn Outlooks. The power lift gates on these vehicles are equipped with gas struts that wear prematurely, prohibiting the power prop rods from supporting the weight of the lift gate for a slow, controlled return to the “closed” position. The Prop Rod Recovery system software in the affected vehicles may not be able to detect and stop a lift gate from falling on a person. Affected owners will be notified by mail and can have the repairs made for free at a GM dealership.